Before starting my project Daihatsu leaf spring conversion, I was told that I should do a Leaf Conversion cause it was quick and simple. A few people told me… “In a couple of days, you’ll be done. There’s nothing to it.” Well, while they have a point on one side, they were WAY wrong on the other. It’s with that reason in mind, that I decided to do this Beginners Fab episode here. So, what exactly went wrong, between what they said, and what truly unfolded? Well… honestly, a couple of things. Here they are. In comparison, a leaf spring conversion is much simplier than a coil spring conversion. It too, is much faster. There is less geotry to figure out, since the springs can only move in ver specific directions, and there is a much more fixed placement measurement that you have to use for mounting. However, that is about where the truth ended for a newb like me. First off, I want you to understand that I’m not accusing anyone of lying. However, there is a human factor involved with memory, that clouds the perspective judgment. This in turn exaggerates memories to either being an easier, or hard task than it really is. You mind, typically only remember specific, important details, and forgets the rest. So, for someone who had done a full on leaf spring conversion before, especially if they have experience with leaf spring vehicles, it’s just easier. They don’t have to think to hard on the components, or how they should go. It’s kind of like a mental muscle memory that taking place. However, for someone like me, this is not the case. I have to try and figure out where to even start from. I have to figure out the best probable angles, and distances. Then I have to figure out how to average that out with what my rig will allow. Another thing that experienced leaf spring suspension fabricators have, is the understand and accumilated knowledge that allows them to predict, within a reasonable rate, the spring rates and effects. This allows them to guess at what the average spring pack leaf count should be, and if the leafs should go over or under. I on the other hand, had to do it the old fashion way. Trial and error. So, this takes it’s own time. Then of course, there are the factors that come into play with the need relocating of this part, or the other. In my case, I had to relocate the shocks. Which, by nature require more design, planning, chassis/axle clean up, and fabrication. All of which takes it’s own respective time. A couple other things that are definately going to make a difference, are the experience one has in fabrication, and the tools/components available for you. When some one has been cleaning tabs/brackets off axles/chassis for years, they have a few things a newb usually doesn’t. One, they have the tools. This is very important, but even more important than just have the specialized tools, is that they have the experience. Even with those specialized tools, if you don’t know the best, or most effective way to used them with a specific need in mind, your work will take much longer. Knowing where to cut, how to cut, and when to cut or grind, can make a huge difference in the time it’ll take you to complete a project. One other factory that comes into play, is a materials available game. For instance, in the States, and in some other countries, fabrication parts are abundant. All you have to do, is pull out the credit card, order on line, and within a week, your fabrication conponents are there. There’s no need to perferate 5/8″ holes in 3/16″ or 1/4″ material, that eats up a BUNCH of time. 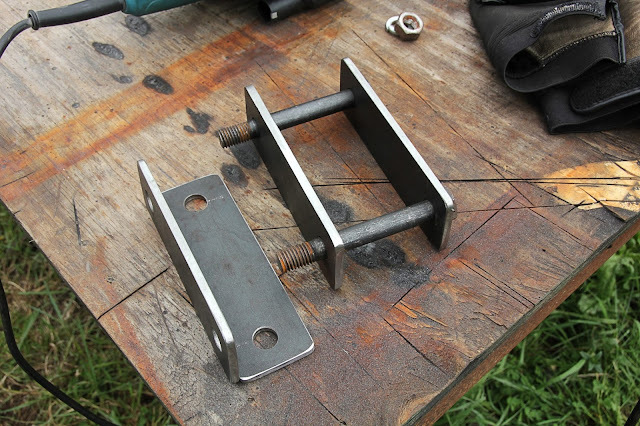 All you typically have to do, is weld up the pre-cut pieces into pivot mount brackets, shackle mount brackets, or spring perches. Not to mention the fact that the shackles are perfectly matched, and there is not grinding required. So, things go faster.